A&A are Devon’s leading gate installers and suppliers. 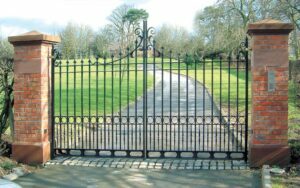 A&A Gates provide a prompt and professional service, suplying and installing gates in Devon. Whether you are looking for a wooden or iron gate, or just looking to add electric automation to your existing gate A&A's highly skilled engineers are trained to meet the diverse needs of both residential home owners and commercial and industrial site managers. Call A&A today on 0800 0832590 for your no obligation quote today!